Virgin Australia’s new NZ business class: telegraphing trans-Tasman intentions? 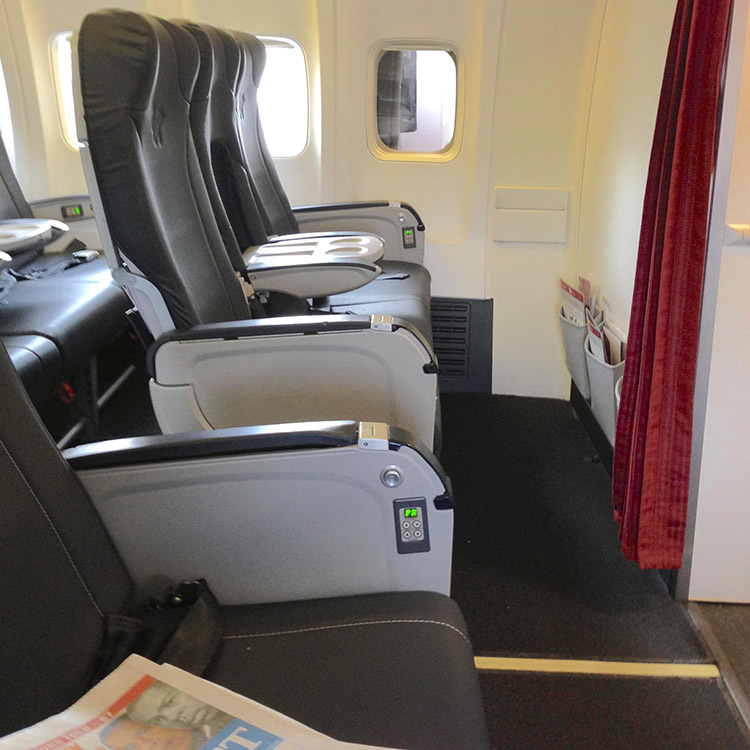 Virgin Australia’s 737 business class seats. 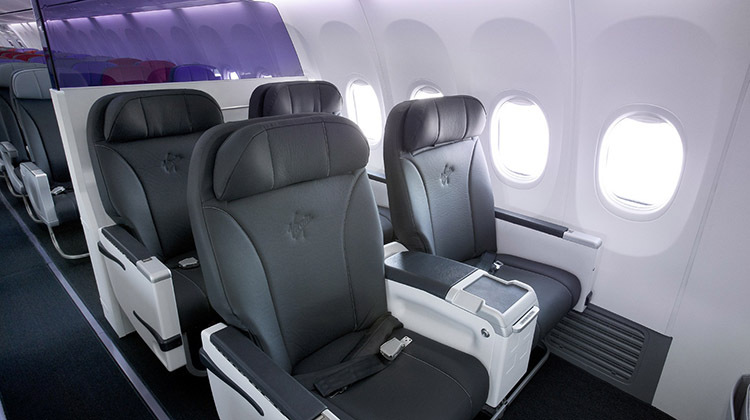 Virgin Australia is to start flying its first business class seats across the Tasman on February 28, with the old formerly red Eurobusiness-style premium economy seats from the age of Virgin Blue and Pacific Blue to be replaced by the 2011-era Virgin Australia recliner seats. Flights between Auckland and Sydney will be the first to see the new recliners, with the airline’s other trans-Tasman routes following suit over the next month as the Boeing 737-800 aircraft are refitted. Passengers will remain in what is effectively a 2-2 seat configuration, since the old premium economy seats featured a fold-down table in the middle seat of three. However, wider seats, greater recline and 38-inch pitch will be a significant improvement on the 10 aircraft due to be refitted by the completion date of March 31. The soft product is also being boosted. Virgin plans “comfort packs with luxurious blankets, pillows, and International-style amenity kits including Australian organic cosmetics by GROWN for flights over three hours”. Also newly on offer: “an exclusive Luke Mangan gourmet full service dining experience,” featuring “premium Australian wines, beers, and spirit selection” and “gourmet tea selection from Madame Flavour”. In fact, since Auckland is the only Air NZ port with trans-Tasman services on widebody aircraft – the only aircraft on which the airline offers business class products – Virgin is actually eclipsing its trans-Tasman alliance partner and quarter owner on flights to other New Zealand destinations. Air NZ’s top offering on its Airbus A320 shorthaul international fleet is Works Deluxe, a Eurobusiness product offering what is essentially an economy product with a middle seat free. Works Deluxe is the top offering of the four “seats to suit” fare families, followed by The Works, Seat + Bag and Seat Only. Apart from the (in fairness relatively comfortable and spacious) economy seats, the economy style Works Deluxe meals are a world apart from Virgin Australia’s inflight food, and there is no divider separating the all-economy Air NZ cabin. The question is raised, therefore, about whether this product gap between the otherwise closely aligned partners will continue. To replace its existing fleet of trans-Tasman and Pacific Islands Airbus A320s, Air NZ has thirteen A320neo family narrowbodies on order for 2017, of which three are currently intended to be the stretched A321. Does the trans-tasman move by Virgin — on whose board Air NZ sits — signify a shift in Air NZ’s seats to suit product thinking? Finally an improvement on the really poor business class service. It was depressing coming off a internal Virgin business class service and then going onto a premium class Brisbane to Dunedin flight were (apart from the extra leg room and empty seat beside you) you were just thrown a menu and a tablet and told you could have as many pies and stale sandwiches and drinks you could consume. Might actually want to use my points to upgrade more often now. About time too.NZ aside with their wide bodies across the Tasman Nobody If you take away your LAN OR EMIRATES offerings and Qantas offers Business Class on this run. Amusingly, Virgin haven’t (yet?) installed the cabin divider on the aircraft it is using for this route. Result? Massive legroom (far greater than business class) in the first row of economy. Sorry my enthusiasm was a bit premature!!!!!!! Just looked on Virgins website and I see that the business class service will only be available if you are flying into or out of Auckland,Wellington, Christchurch, or Queenstown. As if the economy traveller isn’t ripped off enough on the Dunedin to Brisbane route it now seems as even if you choose to travel business/premium you will still get the menu and a tablet thrown at you. Very poor outcome for a frequent flyer travelling redeye from Perth and connecting with Virgin flight to Dunedin!!!! And yes row 3 on 737-800’s on trans tasman flights have always had heaps of legroom. Virgin Australia said on February 27 all trans-Tasman and Pacific Island routes will have business class available by March 31 2015. Perhaps you can check for direct flights after that date whether business class is available for direct Brisbane-Dunedin services.